> IBM APAC > 2019 Annual IBM X-Force Threat Intelligence Index. 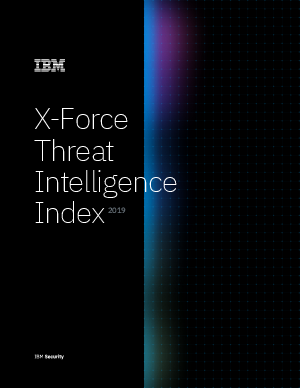 The 2019 IBM X-Force Threat Intelligence Index looks back at the threats, tactics, and trends that emerged in 2018 based on insights from IBM X-Force Security Research Team. Deriving data and insights from security clients, incident response services and penetration testing engagements, the IBM X-Force Threat Intelligence Index 2019 report outlines the most prominent threats and provides key insights into various industries, attack tactics, and major vulnerabilities that emerged during the year.